Seriously diverse New Jersey City University is a public university in Jersey City, NJ that was founded in 1927. 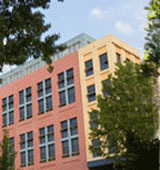 NJCU boasts a core curriculum and offers a host of majors and degree programs; popular programs include business administration, criminal justice, and computer science. Also, NJCU's varsity sports team name - the Gothic Knights - is arguably the coolest ever. What is a typical New Jersey City University student like? Describe the type of person that should attend New Jersey City University. A student at NJCU has to be driven and definitely must be suited for the "city" life. Since NJCU is in the heart of Jersey City, everything is much more fast-paced than your average university. What are the top 3 reasons someone should attend New Jersey City University? NJCU has an extremely unique location, is completely diverse, and most importantly, it strives to help the student rather than hurt them; because as we all know, education can be a very scary thing. What was a typical New Jersey City University student like in high school? Describe the type of person that should attend New Jersey City University. At New Jersey City University, goals and dreams are right at home. NJCU is large enough to provide world-class opportunities for learning. Yet our classes are small enough to afford a highly-personalized experience that empowers students to realize their greatest aspirations. It begins with academic excellence. NJCU's fully-accredited colleges of arts and sciences, education and professional studies offer 41 undergraduate degree programs and 27 graduate degree and diploma programs, including emerging and interdisciplinary fields. A student-teacher ratio of 12:1 and average class size of 24 translate to exceptional attention from a dedicated, innovative and involved faculty. What are the top 3 things that students do for fun at New Jersey City University? 73% of students received Pell Grants, which are provided by the U.S. government to students from middle and lower income families. It gives you an idea of a school’s socio-economic diversity. Campus housing is available for undergraduates. Housing deposit : $150.00. Housing deposit due : Aug 13. Freshman allowed to have car. No pets. Any instructional program in homeland security not listed above. 71% of students graduated in the top half of their class. The average student pays $9,596 for tuition, fees, and other expenses, after grants and scholarships. Total stated tuition is $7,561, in-state and on-campus, before financial aid. Learn more about financial aid at http://www.njcu.edu/financing_your_education.aspx. Estimate the net price for you at http://www.njcu.edu/dept/ir/npcalc.htm. The typical (median) early career salary of New Jersey City University graduates is $47,300, according to Payscale. New Jersey City University participates in the NCAA Division III for college athletics. Want more info about New Jersey City University? Get free advice from education experts and Noodle community members.